This bread does not contain artificial ingredients. Nor does it contain ingredients with protein engineering (GMO's). 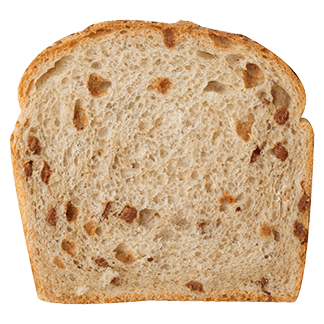 Packed for retail, but still great for foodservice, this bread is designed to have the texture of an English Muffin. 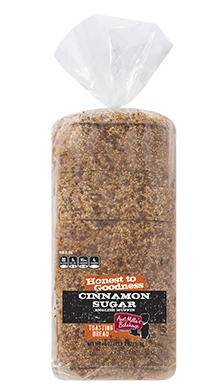 Made with just the right amount of cinnamon and sugar, make your next breakfast stand out with this bread. 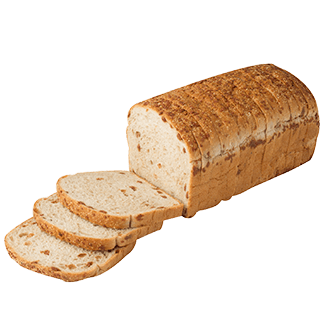 ENRICHED FLOUR [UNBLEACHED WHEAT FLOUR, MALTED BARLEY FLOUR, REDUCED IRON, THIAMINE MONONITRATE (VITAMIN B1), RIBOFLAVIN (VITAMIN B2), NIACIN (VITAMIN B3), FOLIC ACID], WATER, CANE SUGAR, CORN CEREAL, CINNAMON, NON-GMO SOYBEAN OIL, YEAST, YELLOW CORN MEAL, WHEAT GLUTEN, SALT, WHEAT STARCH, CULTURED WHEAT FLOUR, CALCIUM SULFATE, DEXTROSE, NATURAL FLAVOR, VINEGAR, CITRIC ACID, CALCIUM PHOSPHATE, ASCORBIC ACID, SOY LECITHIN; TOPPED WITH CORN MEAL AND CINNAMON TOPPING.